When it comes to summer barbeques and parties, the Fourth of July is pretty much biggest date on most people’s calendars. If you haven’t started preparing for your party yet, now is the time to get on it. And what better way to prepare than by turning your garage into a comfortable rec room for you and your guests to enjoy? Sure, you’ll want to be in the backyard for grilling. But in the heat of the day, when your food is settling, you and your guests will want to be able to find a nice, cool spot to relax. With a few quick add-ons, your garage can easily fill that need. Take the picture above, for example. This garage has everything you might need during your post-barbeque relaxation period, including bottled water and fresh fruit. This homeowner has chosen to also keep jars of peaches and a bag of potatoes in these baskets, but you could just as easily keep a few light snacks on hand instead. Of course, the first thing you’ll need to get your garage organized like this is a custom wall storage system. A wall storage system is a great place to start if you want to convert your garage into a rec room, or at least free up some space to relax in. These custom wall mounts consist of a grid made from heavy duty steel, meaning you can hang just about anything on them. That means you can clear out your clutter, hanging your tools and sporting equipment on hooks. 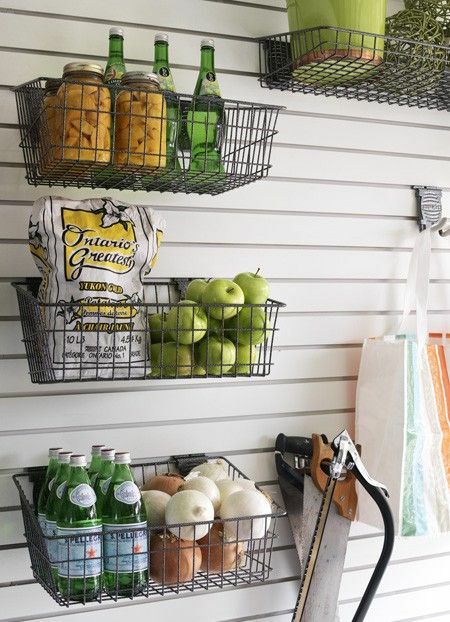 And you can use baskets or shelves to store other items, including beverages and snacks for your barbeque guests. To really upgrade your garage, you may also want to look into a sleek floor coating, which can help transform your space into a functional and easy-to-clean rec room.